Sometimes I read a book or watch a show/movie and think, yeah I really DO like time travel. But it's never a concept that appeals to me on the first suggestion. 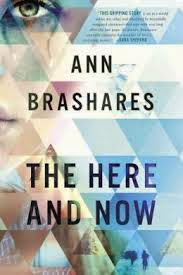 The Here and Now, though, really worked for me despite some of my initial reservations. For instance, I didn't know how I was going to feel about the forbidden love aspect of the story, but I didn't really mind it in the end as it made a lot of sense for the story. Forbidden love is always tricky because it needs to make sense and present a genuine conflict for the characters. So I think in this case the obstacles make sense and are surprising as the story progresses. But that's not what sold me on this story. What I really enjoyed was the time travel story, the mystery, the way the story kept me guessing, and the appeal and rich ideas of traveling back through time for self preservation. There were obvious moral messages about preserving the environment, but these don't come at an easy cost. Basically Prenna has certain rules she has to follow as part of her community, but one day someone throws a wrench in her understanding leading her on a wild adventure to discover if the future can be changed. I enjoyed a lot! Recommended! I read an egalley! Also, this is a good time to bring up maybe my favorite time travel story, 12 Monkeys, has been greenlit to series by Syfy. I don't really know what to think of this...it will probably be terrible, but I WANT IT TO BE GOOD.